Excellent news! This is arguably the biggest hole in comic strip reprinting projects, and I’m glad to see that Fantagraphics is assembling, as always, a top-notch team. >by Dover in 1967 and 1975. Weren’t the strips redrawn in the early 60s? So how could Holt publish them in 1943 and 1944? Moreover: you make reference to Holt’s advertisment, but I cannot see it! To Jeet Heer: Thanks for saying so! I’m a fan of your work, and (if I may say so) it’s quite flattering to see you posting here. 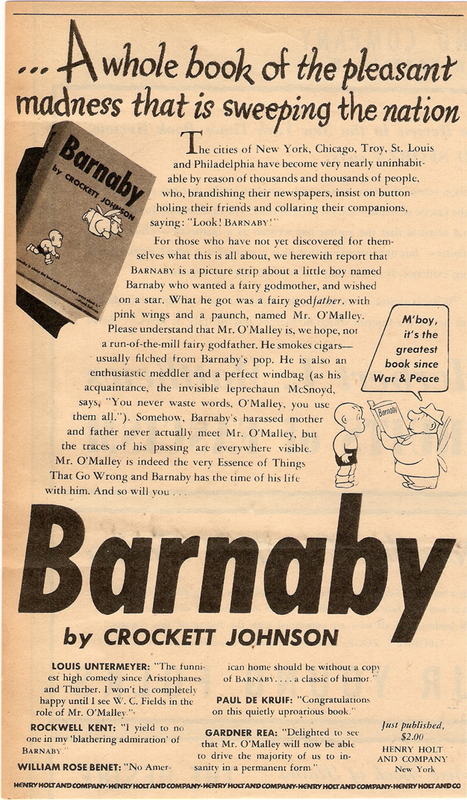 To Marcobar: The Holt books — Barnaby (1943) and Barnaby and Mr. O’Malley (1944) — do not include the original Barnaby newspaper strips. For these books, Johnson redrew what he considered to be the best sequences. In 1960-1962, Johnson updated old storylines and Warren Sattler redrew the strips. These ran in newspapers only, and were never published in book form. Regarding the advertisement: maybe it was simply slow to load when you posted your comment? I can see it this morning. Try reloading the page, perhaps? Not only I still can’t see the advertisment, but there’s no sign of it (you know, the “broken” icon that may appear in place of an image…). However your reply was useful: I opened the source of the html page and so I was able to fetch the image by its direct address! How very exciting! I’m looking forward to reading the strip with some help with historical context. Who wouldn’t love a comic endorsed by Dorothy Parker and Charles Schultz! This is the best news I’ve heard in a long time. I knew that Daniel Clowes was a big fan, and I can’t think of a better team to produce this long dreamed of project.